Tucked in the hills that roll to the Waveney, St Cross is unusual among the Saints, in that it is rather a pretty place. The River Beck has cut down into a sweet valley, and St George sits across a meadow. If you are feeling romantic then you can reach the church by a footpath across a narrow bridge, which gets marooned easily in winter. Otherwise, there is a driveway to some houses which also touches the churchyard. The south side of the church is a grand, austere sight, seeming taller than it is, like neighbouring All Saints. The clerestory seems cut off by the lack of an aisle. The tower is a bold one of the 14th century, and the clerestory dates from the renewal of the roof a century later. The overall impression is of a fat, comfortable, sleepy building at peace on its slope. Among the modern headstones to the north of the church is one to the Canadian poet and writer Elizabeth Smart, who spent her last years in this village. Her By Grand Central Station I Sat Down and Wept, a thinly disguised account of her obsessive love affair with the poet George Barker, became one of the great cult classic novels of the 1960s, and is surpassed only by Shelagh Delaney's A Taste of Honey as a source of inspiration for lyrics by the 1980s cult pop group The Smiths. As a result, this quiet graveyard has become an unlikely place of pilgrimage. Until recently, no pilgrims of any kind would have been able to complete their journey here with a prayer inside the church, for it used to be kept locked. But now, like all the churches in this wide, friendly benefice, St George is open every day. This is a big church, the biggest of all the Saints, and you step into a somewhat austere nave. The interior has been almost completely renewed, and the sober Kempe glass adds to the feeling of seriousness. As at St Michael a few miles off, there is a reredos which reveals an Anglo-catholic enthusiasm in the middle years of last century, with St George and the Blessed Virgin flanking a lamb and flag with the words from the Latin Mass Ecce Agnus Dei qui tollis peccator mundi ('Behold the Lamb of God which takes away the sins of the world'). A pretty pipe organ attempts a note of jollity, and the 15th century font recalls late medieval splendour, but in the wide open spaces of this sombre church it is perhaps a little difficult to feel the heart lifted. Standing in the sanctuary and looking west, however, I knew that this was quite the grandest church I had been in all day, in a part of Suffolk where small, rustic and homely are the usual standards. The great expanse of Victorian floor tiles, as if we were in some north London Anglo-catholic temple, seems rather far from home. 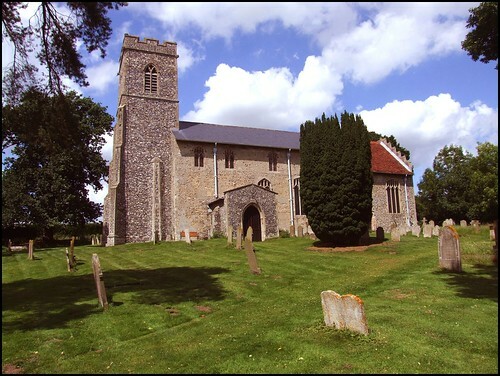 The parish includes South Elmham Hall, once the country retreat of the Bishops of Norwich. This private house contains the ruins of the former Bishop's chapel; even more interesting, and open to the public, are the ruins popularly called South Elmham Minster, a haunting place half a mile out in the woods. I don't know why the village is called St Cross, and the church St George. Some sources claim that St Cross is a corruption of the medieval St George Sancroft. But Holy Cross is a dedication found across the border in Norfolk. Bearing in mind that the words 'holy' and 'saint' would have been identical in meaning to the medieval mind, this seems as likely. An even more interesting theory is that Holy Cross was the dedication of South Elmham Minster.